These educational activities are based on presentations from JADPRO Live at APSHO 2017. Access the full-length video presentation, the slide deck, transcript, and the entire lecture as a podcast. Click on any of the video presentations below to get started! Supported by unrestricted educational grants from Astellas Pharma Global Development, Inc. and Jazz Pharmaceuticals. Hear from expert advanced practitioners about the updated WHO classification criteria and today’s leading-edge treatments for AML. Also learn about the molecular mutations commonly associated with this disease and how to identify patients who are genetically predisposed. This certified activity has expired but you may watch the video without claiming credit. This activity is supported by independent educational grants from AstraZeneca, Merck Sharp & Dohme Corp, Novartis Pharmaceuticals Corporation, Puma Biotechnology, Takeda Oncology, and TESARO, Inc.
Get updated on the latest drug treatments for solid tumors and the clinical trial data behind their FDA approvals. And importantly, learn how to spot the common adverse side effects from these newly approved treatments and how to help patients manage them. This activity is supported by independent educational grants from Astellas Pharma Global Development, Inc., Celgene Corporation, and Jazz Pharmaceuticals. Take a deep dive into the updated WHO criteria for diagnosing myeloid malignancies, the mechanisms of action of new novel therapies, and the growing role of molecular mutations, while also learning how to take a collaborative, multidisciplinary approach to classifying these diseases. 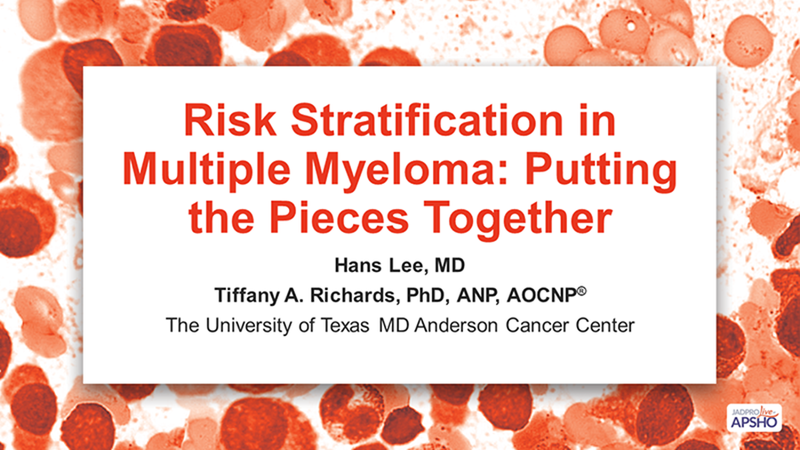 Advanced practitioners are key to managing the evolving continuum of myeloid malignancies and creating a multidisciplinary team approach to managing patients with complex myeloid malignancies. This activity is supported by an independent educational grant from Merck Sharp & Dohme Corp. Learn about Lynch syndrome and other hereditary colorectal cancer syndromes, in addition to which patients are at risk, how to screen for these syndromes, and the relationship between biomarkers and targeted therapies for colorectal cancer. With 95% of Americans with Lynch syndrome unaware of their condition, it is vital that advanced practitioners in oncology be well-versed in the hereditary aspects of colorectal cancer to ensure patients are diagnosed effectively and receive the appropriate treatment. This activity is supported by independent educational grants from Merck Sharp & Dohme Corp, Novartis Pharmaceuticals Corporation, Puma Biotechnology, Takeda Oncology. Get an update on the fast-changing world of therapies for hematologic malignancies. With the constantly growing list of new drugs and indications, as well as the introduction of cutting-edge CAR T-cell therapy for the treatment of hematologic malignancies, it’s important that advanced practitioners stay up to date on the latest advances to be able to adequately diagnose, treat, and help patients navigate potential side effects. This activity is supported by independent educational grants from AstraZeneca, Bristol-Myers Squibb, and Merck Sharp & Dohme Corp. Learn how to identify, assess, and manage the possible side effects from cancer immunotherapy, as well as how to educate patients on what to expect from treatment. With the constantly growing list of FDA-approved immunotherapies for cancer, it is vital that advanced practitioners in oncology remain up-to-date on this cutting-edge treatment area, including the questions that research has yet to answer. Review how genomics are being used to treat rare hematologic malignancies such as Hodgkin lymphoma, chronic lymphocytic leukemia, and mantle cell lymphoma. And learn how, as an advanced practitioner, to evaluate toxicities from these cutting-edge therapies and how to help patients navigate the potential side effects. Get an update on the state of chemotherapy and immunotherapy for the treatment of urothelial carcinomas of the bladder. Learn how these therapies combat the various types of urothelial carcinomas and how to identify their most common side effects, including immune-related adverse effects from immunotherapy. This activity is supported by an independent educational grant from Lilly USA, LLC. Discover how to cultivate and personalize a multidisciplinary approach—involving the medical oncology, radiation, and surgical teams—to treating patients with soft tissue sarcoma in your own institution. In addition, get an update on the staging criteria and current state of systemic, surgical, and radiation therapy options for this disease. Get an inside perspective on how the FDA updates its drug approval processes to reflect the changing oncology treatment environment and to incorporate the voice of the patient. With increasing numbers of oncology drug approvals and the ever-important area of molecularly targeted therapy, it is critical that advanced practitioners embrace and support this change. This activity is supported by unrestricted educational grants from Celgene Corporation and Takeda Oncology. While the past few years have shown an unprecedented increase in the number of agents available to treat patients with multiple myeloma, many advanced practitioners struggle with optimal agent choice, timing, and sequencing, especially related to the use of these newer agents in combination regimens. Learn about these aspects of treatment, as well as testing and diagnosis, risk stratification, emerging toxicities, and supporting patients on oral therapies.